iPad Dress up game: "Where's My Dress?" Kids love dressing up and never has there been a better way to keep the laundry bill down then by allowing them to go wild with their fashion games on iPad. Simply entitled 'Where's My Dress' this latest game up for review has immediate appeal for kids with our 'reviewing critic infant' coincidentally sat on my lap when I first loaded up the Dress Up app. The graphics must have had an instant toddler appeal as she was reaching for the iPad and making all the appreciative noises that you would associate with a happy toddler. With different seasonal settings the kids can dress up their avatars to their hearts content, correct choices will be met with approving sounds and then if the right combination of clothes,hats and shoes are selected the child can send their virtual dress up dummy outside to play. 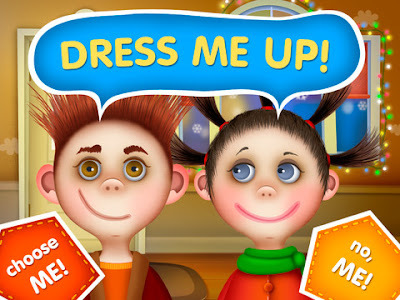 As a dress up game the app delivers on its promise, the graphics are pitched perfectly at kids and if your little ones like their clothes then they'll like this app. There are only 2 characters to choose from and a set wardrobe but it should be more than enough to keep the kids entertained for a few hours of dress up.